For some years my Morgan owning friends have been badgering me to make a Morgan weather vane so I have finally found the time to design and make them. The breakthrough was now having a plasma cutter which makes the hand cutting of the Morgan profile much easier. Made to order. Each car profile is individually hand cut from 2.0mm steel and, just like a Morgan, none are exactly alike. Below right is a photo of an actual cut profile. The driver is wearing a scarf but I am happy to create a bespoke driver for any purchaser, e.g. woman with flowing hair, man with hat, etc. 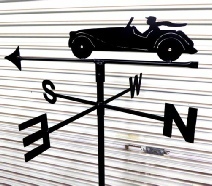 The car/arrow part of the weather vane is approx 600mm long. It is perfectly balanced and rotates freely on a lubricated and weatherproofed ball bearing. The N-S-E-W arms are also about 600mm across. Total height is just over 300mm. There are over 25 hand cut and finished parts which are welded together to form each weathervane. The weathervane is then zinc primed and painted with a durable epoxy enamel. So far they have been painted satin black but the colour choice is up to the customer. The vane can be easily dismantled into four parts for shipping. Price: AU$380.00 plus shipping. 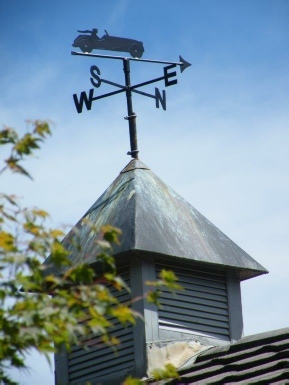 The weathervane can usually be mounted using standard TV antenna mounts/brackets or U bolts depending on its ultimate position. For a small charge I can fabricate brackets if you cannot find something off the shelf. If you would like to purchase just the Morgan profile so you can use it on a DIY project I am happy to supply it. 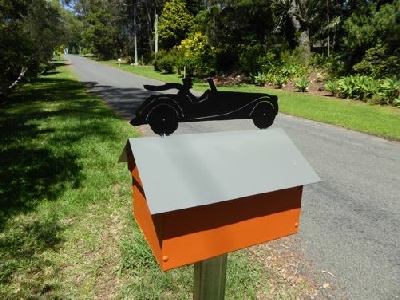 I made myself a new letterbox using a profile. This is a photo of an actual profile which I recently cut. They are approx 400mm long. Price for profile alone: AU$120 unpainted or AU$130 painted in your choice of colour. Please get in touch if you have any questions.